Our final leg of our California trip was the wettest by far. We went to Six Flags Magic Mountain for the day and had the park almost to ourselves due to the rain. Six Flags Magic Mountain has a nice entrance plaza with a carousel that is very well placed. 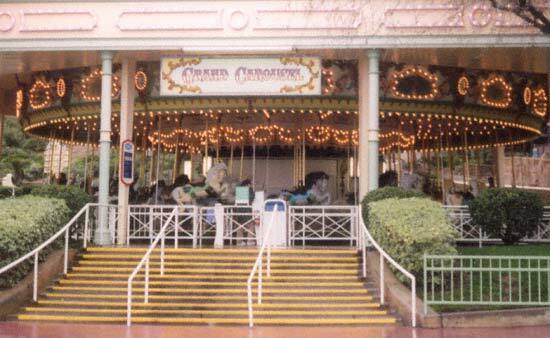 Personally I hate it when a park has a nice carousel and it's hidden off the beaten path. If you've got a good one it should be one of the first things you see in a park when you enter. 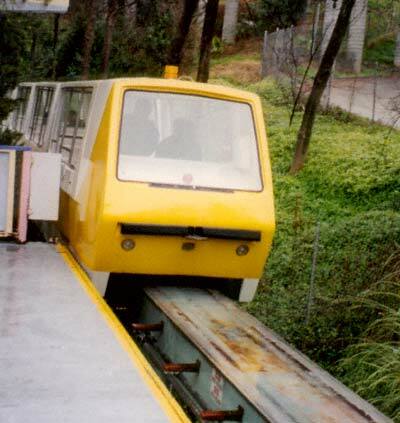 Six Flags Magic Mountain does not have a train but they do have a really nice monorail called the Metro that rings the mountain. In addition to the Metro there is the Orient Express which is a cable car that goes up and down the mountain so that you don't have to climb to the top. Parks with hilly terrain need to have some way for tired guests to either get up the hill or to get back down. My biggest pet peeve about Six Flags St. Louis is that it's built on the side of a hill but there's no transportation to the top. Their train ride does nothing because the stations are only about 300 feet a part so it doesn't do that much good. Oh well, back to Six Flags Magic Mountain. Viva La Revolution! Yes through all the rain that's me in my poncho. 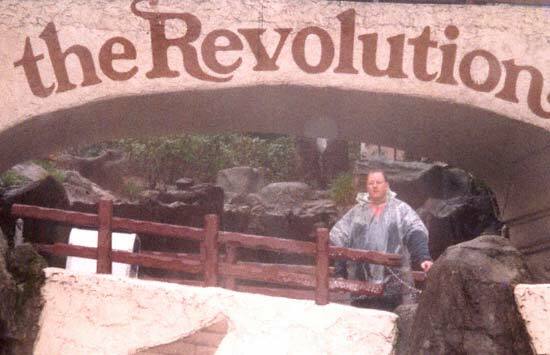 Luckily Six Flags had all their stores stocked up with these great but inexpensive rain ponchos. Click here for more Six Flags Magic Mountain pictures.